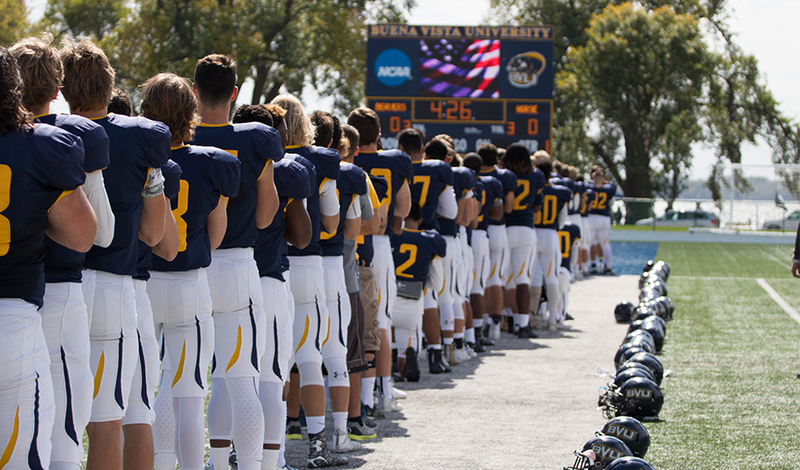 The statement came after a week of tension following several BVU football players and cheerleaders taking a knee during the National Anthem at the Oct. 1 Homecoming game. The kneeling was part of a national movement to bring awareness to racial injustices, according Black Student Union (BSU) President Alyssa Parker, who expressed the protest intent to The Tack before the kneeling took place. Many professional athletes have taken similar actions, whether kneeling or standing in unity for the anthem, a movement started by former NFL quarterback Colin Kaepernick. According to Parker, she and President Merchant were immediately “attacked” via social media following the end of the Homecoming football game. According to President Merchant, safety for students, faculty, and the BVU community is the reason the administration responded as they did. Merchant said he took this approach so that that he was able to truly understand the multiple perspectives on this issue. Merchant says he received criticism from some for what they perceived as a delayed response in the days after the kneeling and prior to his statement, but he assures the campus community that this was, for him, the right thing to do. The Homecoming protest sparked many reactions on campus and beyond. Some comments were positive about BVU, but as national tensions surrounding the issue increased, and given the diversity of political affiliation in BVU’s surrounding communities, a growing number of the reactions became negative. According to Merchant, social media aided in the breeding of that negativity. The Tack story about the protest published the day before the Homecoming game on Sept. 30 generated over 50 comments, and the post sharing the story via Facebook received over 100 comments, some via shares. Other local and regional media outlets also shared The Tack‘s story via Facebook and had comments numbering in the 100s as well. Some comments came from community members and those considering BVU for college, while others came from BVU alumni, donors and former faculty and staff. They included a full range of responses from clearly supportive to vehemently opposed to the kneeling protest. Some of those opposed vowed to dispose of their BVU gear, boycott BVU sporting events or cease their donations. 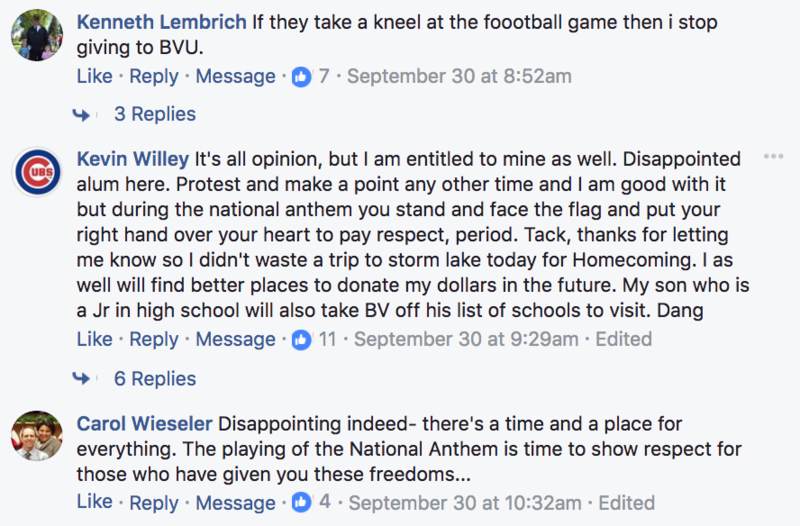 Others expressed disappointment with the method of protest and the fact that BVU coaches and administrators allowed it. The protest also received some positive comments in the same social spaces. Some former students saw the action as hopeful and felt it could help generate conversation surrounding social justice issues on campus. They applauded the students’ activism and freedom of expression. Merchant says that while many people were commenting and debating via social media and via email, nobody bothered to call the Office of the President to ask questions about why this was happening or to try and understand the protest and actions of the university more thoroughly. In the week following the students’ action to take a knee, Merchant not only held meetings with concerned parents, community members, faculty and staff, but also with the students who knelt to better understand their backgrounds, viewpoints and perspectives. One of those students, BVU junior Emerald Jones, is a cheerleader and the Secretary of the BSU on campus. Jones, alongside a number of her teammates, and several football players knelt during the anthem. Jones says the protest was a “moving” experience for her. “I was just not expecting it to be as completely silent as it was – you could hear the wind. So, while I was sitting there I was like, ‘This is exactly what this was meant to do, [it] was to be a silent protest.’ This is the same thing that Rosa Parks, [one of] the same things that MLK, and the same things that other people had to do to get the point across. Honestly, it felt more liberating than anything I have ever done so far,” said Jones. Merchant invited the student athletes and cheerleaders to his home, and held a dinner and discussion to help him come to make the best decision for BVU. While many of the students involved agree with Merchant’s request that BVU teams stand with their arms locked in unity if they so chose during the anthem, some do not like the suggestion. Parker says she believes this request is unjustified, and she plans to stand strong in her beliefs. “[You have to make] choices that you think will help the campus, and help your students become more educated and more culturally aware of things they don’t know. Isn’t that a big part of coming to college? You learn about things you didn’t know [living in] your hometown, you take classes you didn’t have to take [before], and you become a better, more empathetic person,” said Parker. Parker says there were times of disagreement between herself and President Merchant, but Merchant states this did not hinder the productivity or civility of the conversation. One criticism of the recent statement from Merchant is that it was fiscally focused. Some critics expressed that the university seemed to be “cowering to the donors,” but Merchant insists this is not the case. Merchant’s statement also outlines what both he and the institution will do moving forward. Merchant will stand with the players on the field during the anthem as a show of unity and solidarity with them. He also indicated that his office will commit financial support to efforts aimed at advancing the conversation around social change. He noted that the dialogue at BVU about racial injustice would continue. “Over the next few weeks we will be working directly with students, faculty, and staff to plan several campus gatherings that will create an open discourse that is meaningful and purposeful,” he wrote. Merchant says those actions are already occurring, including collaboration between the Office of the President, student organizations, and the BVU and surrounding communities to increase positive dialogue about social injustice in our nation. Merchant says the Office of the President will be co-sponsoring events in the near future that identify and engage in social justice dialogue. The Office of the President has been working closely with student organizations on campus like the BSU, as well as M.E.L.T, Student Senate and the Office of Multicultural Engagement to prepare for the increased dialogue. Director of Multicultural Engagement & Student Activities Ebony King, along with student organizations and faculty, have prepared the first opportunity for more dialogue, an event on campus discussing the nature of social injustice taking place next week.